The Divorced Pastor: Is He the Husband of One Wife? In the previous generation, the possibility of hiring a pastor who was divorced was rare. Societal expectations and ecclesiastical standards would exclude a divorced man from the gospel ministry. With the surge of divorce following World War II, broken marriages were found in more than a few manses. By the 1980s, a growing number of clergymen were divorced and remarried. It seems that Hosea’s prophecy had come home to the American church: “And it shall be like people, like priest” (Hos. 4:9). Divorced Americans now include divorced pastors. The position that pastors must be married (with children) is untenable. The apostle Paul himself was single without children. Paul was simply presenting the typical situation: a married man with a family. He also would not exclude widowers from office. If in 1 Corinthians 7:39 Paul allows for remarriage, there is no reason that pastors could not take a second wife upon the death of a first wife. Polygamy may have been practiced by Jews but was illegal in the Roman Empire, and never practiced in Greco- Roman society. Paul’s statement in 1 Timothy 5:9 that a widow be “the wife of one husband” is not a reference to polyandry. Christians never practiced polygamy or polyandry. Clearly, the context is key: pastors are to be “above reproach,” examples of godly men, and models of domestic spirituality. They are, therefore, prohibited from engaging in any sexual immorality or from violating their own marriages in any manner whatsoever. I. Howard Marshall makes note of the positive nature of this phrase: “It is positive in tone and stresses faithfulness in marriage, rather than prohibiting some specific unsanctioned form of marriage.”3 In other words, “a one-woman man” is a sexually pure man, a faithful husband, and a devoted lover of his wife. Paul is not referring to a leader’s marital status, as the absence of the definite article in the original indicates. Rather, the issue is his moral, sexual behavior. Many men married only once are not one-woman men. Many with one wife are unfaithful to that wife. While remaining married to one woman is commendable, it is no indication or guarantee of moral purity. The Key Issues. Should, therefore, a man become a pastor or, if already ordained, remain in the ministry after a divorce? In answering this question, we must consider four facets of Paul’s teaching. First: the biblical rule, or the “letter of the law.” Certainly, both Jesus and Paul allow for a “biblical divorce,” and for the possibility of remarriage, but “only in the Lord” (i.e., to another believer). If a pastor’s wife commits adultery, or if she quits the marriage without desire to reconcile, that pastor is “an innocent party.” The church should grant him permission to divorce and allowance to remarry. Pastors fall under the guidelines and freedoms of Matthew 19 and 1 Corinthians 7. Second, we must consider the “spirit of the law.” Pastors are to be “one-woman men.” It is not enough merely to stay married. A pastor with a bad marriage is as disqualified from ministry as an adulterer or a deserter. If a man does not love his wife as Christ loves the church, with gracious allowance for the fact that he is a sinner and not the Savior, then he should not be a pastor. A pastor’s genuine, pure, and spiritually edifying love for his wife is the backdrop of all of his ministry. If a man can’t love his wife with a singular devotion, then he will not love Christ with a single heart or his congregation with a single focus. It may well be our failure that we are concerned about the letter of the law of marriage while we miss the essential spirit of the law of marriage: “Husbands [pastors], love your wives as Christ loved the church and gave Himself up for her” (Eph. 5:25). Third, we need to apply the biblical principle that overrides all of 1 Timothy 3 and Titus 1: “Therefore, an overseer [bishop] must be above reproach” (1 Tim. 3:1 and Titus 1:6). Gordon Fee explains that this “has to do with irreproachable, observable conduct. Here it seems to be intended as the general, covering term for the following list of eleven virtues, or qualities (mostly single words in Greek) that should characterize an overseer.”5 A pastor’s marriage, his conduct with the opposite gender, and the use of his own sexuality should be free from observable misconduct that would embarrass or shame the gospel ministry. Fourth, there are practical concerns that divorced clergy cannot ignore. Their integrity will certainly be called into question, regardless of the basis for their divorce. Their ability to speak both prophetically and pastorally into troubled marriages in their congregation will be tainted with an aura of hypocrisy. The confidence people have in them will be weakened by any divorce. And their acceptability to a specific segment of their congregation will be ruined by a divorce. His ability to say, as Paul often did, “imitate me as I follow Christ” is weakened by his failed marriage. The Key Question. 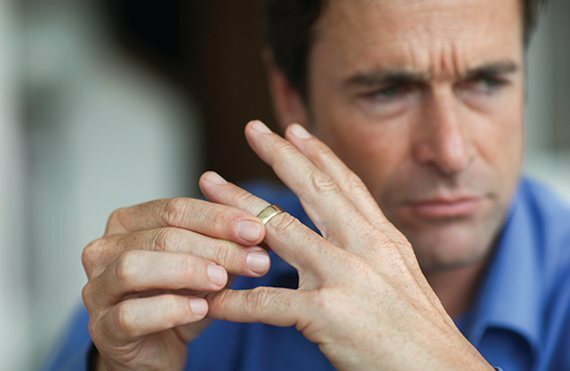 So should a church hire (or keep) a pastor who goes through a divorce? This is a complicated question with no easy answer. As much as modern evangelicalism likes simplistic answers to complex problems, an honest response to this earnest question is neither yes nor no. Pastors who are biblically divorced may well be free to remarry; to do so is not sin. Nevertheless, divorced pastors would do well to remove themselves from pastoral ministry and should consider transitioning into other facets of Christian ministry. The integrity of marriage, confidence in the pulpit, and trust in the pastors of our churches may all outweigh a man’s right to continue in office. His right may well need to give way to the greater responsibility to place nothing before his flock that would be either a stumbling block or a discouragement to their growth in grace and holiness. In the end, it remains the choice of the congregation whom they call to be a pastor. If a man was divorced prior to becoming a Christian, then 2 Corinthians 5:17 comes into play: “If any man be in Christ he is a new creation; the old things have passed away; behold, new things have come.” A divorced man’s pre-Christian life is certainly part of the “old things” that pass away. Life in Christ warrants for all believers a “new lease” on life. Congregations may also, legitimately, conclude that a divorce for a Christian man was so long ago in the past that it should not hinder his witness or his work in the pastorate. There are no hard and fast rules; only principles, to guide a man in the ministry or a congregation seeking a pastor. Michael F. Ross is the senior pastor of Christ Covenant Church (PCA) in Matthews, North Carolina. He has been married to Jane, his only wife, for more than thirty-five years. George W. Knight, III, Commentary on the Pastoral Epistles: New International Greek Testament Commentary (Grand Rapids: Eerdmans Publishing, 1992), 157. John R. W. Stott, Guard the Truth: The Message of 1 Timothy and Titus: The Bible Speaks Today Commentary Series (Downers Grove, IL: InterVarsity Press, 1996), 93–94. Howard Marshall, The Pastoral Epistles: International Critical Commentary (London: T&T Clark, 1999), 478. John F. MacArthur, Jr., 1 Timothy: The MacArthur New Testament Commentary (Chicago: Moody Press, 1995), 104-5. Gordon D. Fee, 1 and 2 Timothy and Titus: New International Biblical Commentary (Peabody, MA: Hendriksen Publishers, 1988), 80.